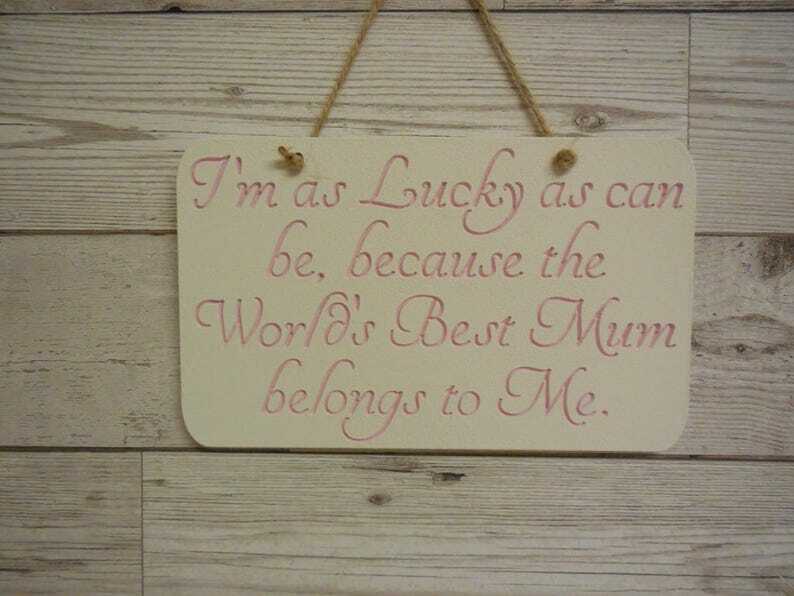 This lovely worded quote plaque is made from freestanding 18mm MDF (pictured) engraved & hand painted with the wording & details picked out in a different colour to show the lovely quote. These can be painted in any colour you wish I have used the pictured one as an example. If you wish to have this painted an alternative colour please use the message function at check out with your choices. Would make a lovely gift to your mum for any occasion especially Mother’s Day or a birthday. My current turnaround time is 3-4 weeks however if you have a date in mind you would like your order please get in touch. Where possible I use recycled materials for my packaging, please take care when cutting away any tape sealing the boxes. I only offer refunds on non personalised items, any item where you add a name or family member title too these items are classed as personalised & made to order therefore unless the item arrives damaged or faulty then Im afraid I cannot offer a refund. Please check all spellings & wording when you order as once submitted unless the error is my fault then I cannot be held responsible. UK Postage - All items are now sent Royal Mail 1st tracked, Royal mail estimated delivery time is 1 day in the UK however during busy periods this can be longer. Please allow up to 10 days before reporting your item as missing. I will only offer refund or replacements once I have investigated with Royal mail the location or the missing parcel. If you opt for a replacement please note that if the item is personalised there will be the same time period for delivery as if you first ordered due to delivery from suppliers who cut wood for me however I will do my upmost to make this turnaround time as quick as possible. Postage outside of the UK - I send all items by Royal Mail international Tracked please allow 7-15 business days from the date of dispatch, please note this is in addition to my time allowed to make your order. I cannot be held responsible for any customs hold ups or import charges, Please allow 30 days before contacting me to report a missing item. After this time please get in touch where I will be happy to replace or refund. The sign was perfect and absolutely beautiful! The service was great! After purchasing a set of bookends for my daughter, I didn’t hesitate to buy a set as a present for a friend. Both were beautifully handmade and personalised.thank you! Absolutely love these bespoke bookends. All my products are made from MDF & therefore are only suitable for indoor use. When cleaning do not use any cleaning products as this will mark the paint, I suggest using a damp cloth to gently wipe away any dust. Avoid using dusters or cloths where the fibres come away easily as this will come off & stick to the areas where the MDF was cut. When sending your order I use as much recycled packaging as possible to keep costs low. Please take care when opening you parcel to avoid damaging your order inside. You have 24 hours to cancel any order placed with me once the 24 hours has past I will then order wood to be cut from my partner suppliers. After 24 hours and once the order with my partner supplier has been placed you cannot cancel your order as it is then deemed to be unable to be resold. if you have any issues with an order you have placed please contact me & I will do my up-most to see what I can do however please understand I must follow my policies regarding custom orders. I hope it will never be the case but if for some reason your item has arrived damaged, please contact me. Any damage or loss will be covered by me, but Photographs will be needed for damaged items as I must follow delivery company procedures. custom items that are personalised are not returnable unless faulty or damaged, all issues must be reported within 48 hours of delivery. Refunds will only be issued to items deemed either Lost or Damaged. Damage caused by an individual such as the customer will not be covered. Items spelt wrong will not be replaced, please check all spellings before placing your order. I cannot be held liable for delay caused by delivery companies nor will I provide compensation or refunds for this. I send all parcels using a tracked & signed services, via Royal Mail but if your parcel is heavy it will be sent via courier, in this case you will receive an email from them with all the information on once I have booked the parcel in. I aim to send items within 4 weeks from purchase. During busy seasons, please allow up to 6 weeks for your item to be made & dispatched. Each item has their shipping time stated on the product description, however, if you require it sooner please contact me directly before purchasing & I'll do my upmost to help. I send all parcels using Royal mail international tracked please allow 7-15 business days from the date of dispatch, additional time may be added outside of my control by customs. Please allow 30 days before contacting me to report a missing item.